We're Rocking our Red Pumps Today! Did you know that March 10th is National Women and Girls HIV/AIDS Awareness Day? 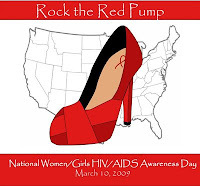 In it's honor, Shoes & Booze is participating in the Red Pump Project, which is a campaign to raise awareness about the effects of HIV/AIDS on women and girls (if you noticed a lot of women in red pumps today, it's probably due in part to RPP). Whether directly or indirectly, HIV/AIDS affects millions of people, including our team, so this is an important cause. There were events throughout the country today, but some will be ongoing, so check out the National Women and Girls HIV/AIDS Awarness Day schedule to see what's happening in your area. We also strongly suggest that you visit and subscribe to the Red Pump Project's blog for information and statistics. By the way, have you been tested? If not, it's about that time. Know your status! In the meantime, what do you think of StyleScrybe's red pumps? Thank you SOOOOO much for participating in the RED Pump Project! We appreciate you and the other female bloggers for being a part of this initiative to raise awareness on the effect of HIV/AIDS on Women & Girls. Much Love!